The Maverick Horseback Breakfast Ride is one of the best reasons to get up early while you are on vacation in Las Vegas. Wranglers greet guests at select locations and then transport them to a working ranch just a few minutes away from the city. Before you set out for the morning ride, you will enjoy the peace and tranquility as you feast on a hearty cowboy breakfast. The menu includes pancakes, eggs, hash browns, a choice of breakfast meat, orange juice and coffee. Vegetarian meals are available upon request. Knowledgeable guides will help you select the right mount based upon your equestrian skills and weight. No previous riding experience is required. The horses are very sociable and disciplined. During the one-hour ride, you will cover some of the same terrain traveled by Native Americans, explorers, settlers and Old West desperados. In the Red Rock National Park, you will be amazed by the majestic painted landscape that has been formed over the millennia by wind and rain. In addition to the awe-inspiring scenery, you may notice roadrunners, jackrabbits and Big Horn sheep as well as grazing horses and cattle. 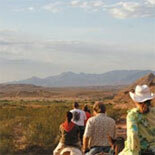 When the ride is over, you can enjoy the petting zoo and cowboy town before the ride back to the Las Vegas Strip. From the pickup time to the return trip, the entire experience takes about five hours. Awaken early so you can star in your own Wild West Adventure and still have plenty of time to enjoy for another Las Vegas attraction.